I just had to say I'm home! Finally! And what a trip it was! My Dad is home, safe and sound, but only by God's Grace! What a day it's been! I'm so exhausted! What a week it's been! I've got to get some rest, but tomorrow I'll check in, again! I'm so sorry that I have left so many e mails in the lurch. I'm in attack mode, starting tomorrow! Both on the mod board, the e mails, fixing the weather station, all! Good night for now! Gotta go cuddle my Kilchis doggy! It's the 10th of December. I have no tree! I am so glad I put up some decorations before I left! I thought it was early, but it's not now! I flew home, yesterday. Part of me wanted to just stay there with Dad. Even though he's ill, we were having fun, together. My Dad and I always have fun! We talked, we visited, we went out to breakfast, and ate good food! I got up this morning, feeling a bit displaced. Where's my Dad? I was beginning to get used to the new routine! It's so nice to be home, though, even though I thought it was cold in Palm Springs! I didn't know the meaning of cold, I guess! It's difficult to write, until I'm caught up. I wish I could spend time right now to write about my experience, but I feel rushed to catch up on what I need to catch up on. But, I wouldn't trade last week for anything. I am so blessed, even though it was difficult-- to spend time with my Dad, who will be 85, this year. I have so much to be thankful for! The Kilchis valley is all frozen over and white and everything is cold, but beautiful! Thank you, Father, for everything in my life and all of my tremendous blessings! I will be back! So much to share! Good morning! Man, I worked hard yesterday, trying to play catch up! I think I am! I think I am caught up! Please! We only have one day for the run off vote for the Kwikfish! Vote for your favorite 2010 Kwikfish, here! Then, we are going to also do a Mag Lip lure for 2010, too! That will be next week! Lostpuppy won the toy total contest, and will be the proud owner of either a TH custom rod or a Clarion reel! Way to go, Lostpuppy! Thank you to STGRule for putting that contest up, in my absence. Really appreciated! I also SO appreciate what all the volunteers did for the Kids Toy Drive this year! I was astounded by the work they did, and my brother helped to get Gary Cheney from Bullet Freight to drive the truck again and it was so awesome! I don't think I've ever been more distracted then I was at this year's Christmas party. I had so much fun seeing the people that I did talk to, but I missed so many. Being I was going to Liz Hamilton's for the night, and then flying out the next day to help my Dad, I was just feeling chaos, the whole time. I'm so sorry to those I didn't get to talk to! However, I just wanted to get things done and get those toys to the kids! We were so successful in doing that, and it's mostly because of the volunteers who made it happen! Thank you to every one of you! I'm just floored. I know that I've forgotten to thank a bunch of people, and for that, I apologize. All the people who did auctions, and all the people who counted toys and all the people who loaded the truck and took them over... THANK YOU! Thank you from the kids!!! You have made some child, somewhere, very happy! I am to the point where if I don't get more help, I am going to have to give up ifish. I know that. I really do. Life is too short and I'm missing out on close relationships with those that I love. I just can't continue on this way, because if my life were cut short, I am beginning to wonder if I'd regret not going slower? Not sitting down with friends that I love with a candle going, talking over a cup of hot tea as the snow falls? Not taking walks, holding hands and talking softly to those that I love? Not hugging the people that are closest to me, and not taking time to listen to them, when it's most important? It seems, especially lately, that I'm on a constant rush just to get things done, rather than enjoying the journey of getting things done! I want to talk and write about Christmas and that old and wonderful feeling I used to get in the pit of my stomach... that excitement! And how we can all bring it back!?! Recreate that feeling! Yes! I want to sit with my son and my friends at the kitchen table and have tea or hot chocolate and look over the frozen land and be thankful for the warmth!! I want more hugs! I want to cuddle my dogs, and pet my kitties and have time! Isn't "time" precious? Anyhow... I'm off to get some things done again! I'm a slow learned, but I'm going to go slow, and learn how to go slow real fast, here!! Bill and I are off to find a Christmas Tree and the boys and I are going to decorate, today! Are you? Thing is, I haven't made a page up for December, and I have 331 e mails to answer, and my private messages are stacking up! Help! I must reread the following again and again! I have lived on the Kilchis river for nearly eleven full sets of seasons now. As summer fades each year, I notice on the drive over the coastal pass that the first of the Fall leaves turn all shades of hilarious color. All around me, signs point to the migration of salmon up the Kilchis River. This is the parade of events that I love. Later in the Fall, I have an aquarium filled with spawning salmon out back. Unless the river's flow changes my "furniture", I sit on a grassy knoll, and try not to move my arms so as not to spook them. I watch, as they come and go. They flip on their sides and flash silver at me as they dig their redds. I love that! I've come to love that as much as I loved Christmas as a child! I get that excited pit in my stomach, just the same! I think we should all send out "Salmon Spawning" seasonal cards, just as we do for Christmas! It's fascinating! Just as I used to wait for Santa to arrive down my chimney, I can sit there for quite some time, waiting for salmon--before realizing that dinner needs to be cooked, or the kids taken to town. I feel more in tune to the goings on of the river, than of the leaves on the trees, or the life in my garden, or the temperature of the air around me. The salmon have set Fall as my very favorite season. They are so easily visible in all that they do, from a huge splash in the current when they are chrome bright and feisty, to the death roll they attempt, as their lives end, in the stillness of the back eddies. Their death and spawning mark the end of the Thanksgiving Holiday for me. I sit and watch for hours, as they dig their redds, flashing their chrome bright sides like a flash from a camera. The fanciful colors of chum salmon are in direct harmony with the brightly colored leaves of early Fall. So beautiful! These same salmon seem to age with an amazing speed. Just as the trees leaves sog and turn to earth, the bodies of salmon melt into the rocks on the river. Some are dead, laying in the shallows, some are barely finning, slowly floating away from their nest. Early December seems to always bring low water levels. Frost sticks on the ground. Small pools turn to glassy ice, and long days without a shadow grace the canyon. A sparse new salmon enters the stream, exciting a fishermen, just as the last leaves of the trees fall into the biting December wind. The river bank and the slow current less shallows are littered with salmon carcasses, and I have to scold Kilchis to keep him away. A high water will come, sometime mid December, and with it, wash away any signs of salmon. But on the return flow comes the river's own Holiday festivities! The Steelhead dance in, celebrating Christmas! We prepare for the celebration of the birth of Jesus Christ in such timely fashion! Excitement fills the air! I want Bill to row me to the other side, so that I can hang a silver ornament on the tall tree that shadows the deepest hole. A welcome ornament, for our holiday guests. Steelhead! They dance and jump like sugar plum fairies! Everyone in total celebration!! I fell in love when I was 26 years old with a man who wooed me with hand picked flowers, poetry, and bedtime stories. I'd fall asleep to his sweet voice. Young love! We spent much of our time visiting rivers along the coast of Oregon. He scratched out love notes on bits of paper and as the sun fell, he read to me from his favorite books. That love expired, but I still have that book, and those hand picked flowers still remain, pressed in between the pages. I can't tell you the number of times new friends have been created by the words, "Have you read "The River Why?" I know instantly that I have a common bond, and a new friend when I hear those words. People in love with fish read this book. Most have the same passion for rivers and streams and the earth, as I do. These people are by far my most favorite people. I have several copies of "The River Why." I did a search on ifish for, "The River Why" It's linked hundreds of times. Quotes from Duncan's books grace our members signatures and are memorized by many. I often receive this book in the mail as a present from ifish members. "Have you read this book, Jennie?" the notes ask. I write thank you's and save each copy. No one can have too many copies of the River Why! One for the bathroom, one by my bed, one for my children and one for friends. You know, I too am known to ask, when the time is right, that very intimate of all questions between anglers and lovers of our rivers and streams! "Have you read "The River Why?" I have moved on from the love who held my hand and read to me, but my love has lasted strong and true for one of my favorite stories, "The River Why." Think about it as a Christmas gift, this year! I’m a fishing fanatic, but have come to learn that even more; I love any kind of close encounter with salmon. At home, I stand in the shallows as the parade of spawning salmon lazily fin against my boots. I gaze for hours from shore, watching their spawning rituals. 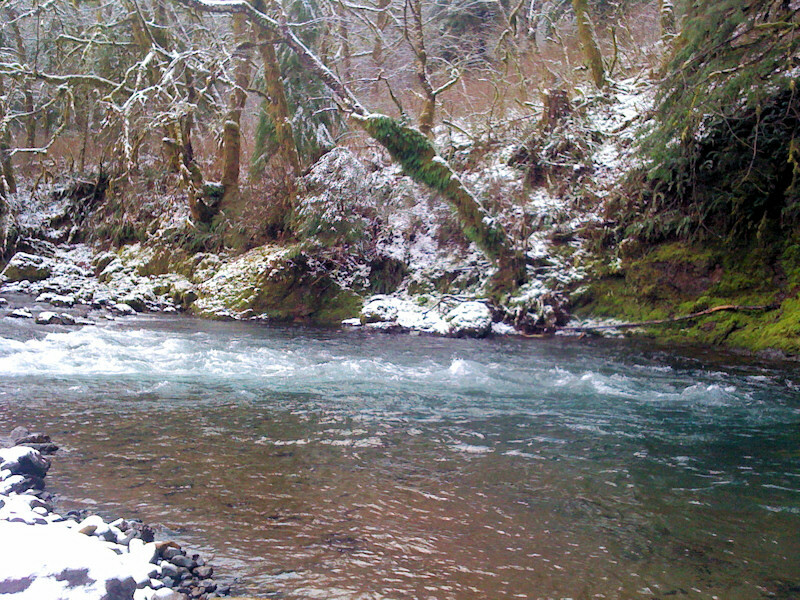 When the river is higher, my breath catches as chrome bright salmon break the smooth, full current of the river. Likewise, I’v been moved to tears as I leaned over in my boat to touch one whose life was nearly over. She performed a slow death roll in the stillness of a back eddy, right beneath my fingertips. The salmon have set this time of year as my very favorite season. I think every one of us here are filled with wonder, as the migration parade on our Northwest rivers, begins and ends. But, each year I panic. How many years of this do we have before they are just a story we read to our children? A high water will come, sometime in mid December, and with it, wash away any signs that they were ever here. Will they be back? Each year, these concerns become more and more real to me. This year, there are fewer dead salmon on the bottom of the shallow river, then I've ever seen! Over 26 thousand people have signed up on ifish.net, and I’d bet my bottom dollar that most have this same wonder, love and concern for salmon that I do. On the internet, our combined passion rises as we argue amongst ourselves regarding how best to preserve our salmon. One thing we all agree on is that it needs to be done, and done now. I just keep praying that we can all come together to work towards a solution. If we don't, there will be no reason for ifish.net. It’ll be just a sad web site with nothing to talk about except memories. As one big family, we gather here on ifish, to talk, to share our passion, to discuss. I am impressed by the numbers of us! It gives me hope. We have to save our salmon! As long as we still have the chance, I will hold onto my hope. It will take the same strong motivation it takes a salmon to get upstream, for us to make a change in our salmon population. I worry that we have all lost that kind of motivation. Mother Nature can change our seasons in one day. Can we help her save our salmon in one lifetime? My worst nightmare is to think that perhaps one day my kids will tell stories to their kids... of a day when their Mother used to walk down to the river and watch the salmon spawn. Will my children's children even know what a salmon-filled river looks like? My house is all cheery and decorated and I have lights, everywhere! He said yes. The right thing to say, indeed! I love getting up in the morning in the dark and turning the tree on. No one else is up, and I just love that time! Candles are nice, but nothing is better than a lit tree! I put Francis' chapter 16 up, so you'd better catch up if you are behind! We have one chapter left! Man, is this a great book! I've been reading along, even though I've read it twice, before! It's pouring down rain and I decided to go get a pedicure. I can't wait! Nothing feels better than a foot massage and nothing looks prettier than toes all painted! Thing is, no one will see them but me, in this weather... but who cares? I like them just fine all by myself! Whoo hoo! IS it windy! And our weather station is broken! It's not registering the wind! Agh! There is nothing worse than a broken weather station. I have ordered parts, but please be patient with us! It takes time and when it's down it sure does bug me! I wonder how many times I write "Thank you!" a day. If that shouldn't tell me something, I don't know what should. I mean, thank you to Glenn and Ginny who sent me some bubble bath. Thank you to the Chris, who picked up Bill's tackle bag, after I left it at the party. Thank you to Kevin Newell and Jay who donated 550 dollars to the children's toy fund. Thank you to Franics, for the rights to print his book. Thank you to Stan, for writing his monthly columns, here. Thank you to the mods, both classified and super, for all that they do! Over and over! Thank you to the five people today, who asked to advertise on ifish! I do! That's my job title, I think! The "Thank you" lady! I am so thankful! I really am! For so so so many things! Oh! And thank you for Buzz taking the time to help me set up the new coloring contest, here! 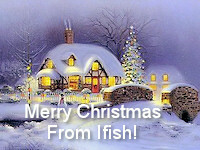 Off to the city to do some ifish business and to deliver some of Santa's goodies to friends and moderators. :) Have a great day! Follow my travels on Twitter! REMEMBER THIS AT CHRISTMAS TIME According to the Alaska Department of Fish and Game, while both male and female reindeer grow antlers in the summer each year, male reindeer drop their antlers at the beginning of winter, usually late November to mid-December. should've known... ONLY women would be able to drag a hefty man in a red velvet suit all around the world in one night and not get lost. This is why my hands were all inked and glittered! You can watch the video on how to make these, here. Of course, you can decorate them however you see fit, but I bought a bunch of Christmas paraphernalia, and used ribbons and decorations and pieces off of old ornaments that were broken. I glued them on with a glue gun and went to town! Oh! And then you can buy glitter glue, and I used that as a pen to draw the lettering. What's neat about that is if you goof on a letter, it just peels off when it dries. I found this such a wonderful diversion from sitting at a computer. I tend to have to sit a lot of the day, so sitting somewhere else is a relief! 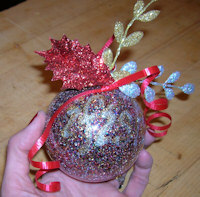 I turned on the Christmas Music and went to town gluing and glittering! Fun! I made these for the ifish mods this year, and (sh!) I made one for my Dad and a few special friends. I love them! I really do! You get into the groove of it, and it's hard to stop! Someone please help me find time to fish. OK? I don't get it, but I am not fishing and it bothers me. I love to fish, but it seems that I don't have the energy or time, lately. Maybe it's just the season, that it's so busy right now? But, if I had the time and energy, I swear I could spend all day and more on ifish, just catching up! Reading my mail, and moderating the board. I AM going out to go fishing, this morning! I am! I am! Oh! BTW, ifish has been so slow lately! Last night, we received a wonderful Christmas Gift! Billy, over at Vertex host, doubled our RAM from 4 to 8. It should be snappy! I'm so excited to have the old zip back! Order ifish decals for stocking stuffers! I think you still have time! This special offer is available till New Years, regardless! Oh, gosh. What a day. This song is ripping at my heart. The new Herbie Hancock CD is out, and I'm in love, again. I saw him with Chic when I was in high school, and have had a thing, ever since. Anyhow, the song is "Don't explain" featuring Damien Rice & Lisa Hannigan. It's heart wrenching. I love the entire album, though! Anyhow... Hee hee... Lookee what I did! I'm just a busy elf, trying to get everything accomplished! My kids are 60 something, 22 and 21, and they were all good this year, so Santa is BUSY! I didn't even get to make cookies or candy, so I suppose that will happen, tomorrow!? Yikes! The tree is getting full, underneath! Everything I bought, I got second hand, (almost everything, except some of the smaller goodies) and I feel really good about Christmas, this year. It's going to be about Jesus' Birthday, and not so much commercial! I like that! I do! We've had Christmas music playing throughout the house, and the house is really lit up! I'll have to do a video to show you how beautiful it is! Chris Vertopoulos stopped by last evening for some visiting and a glass of good cheer. It was so good to see him! He looks great! An ifish member is going to stop by today with one of the last presents I bought for one of the kids. (Not telling any more!) She is going to fish a while, I hope! And then, Santa (that's me, but don't tell!) is off to Gaston to collect another second hand present! I'm losing the get up in my go! Of all things, the river is in good shape, and I want to get out there! I'm worried about Kilchis. He's been sick for the last week, going to the door every 10 minutes to go out. He's such a good doggy. Even when he doesn't feel good, he tells us and goes out to do his business. He's such a love! He has such soft ears and such a sweet spirit, that dog. He truly is a best friend and I want to take the best care of him, that I can. That said, I'm off to shower and then to take him to the river to see if he wants to play for a bit. It's icy cold out! The sky is a brilliant whitish blue! Icy skies and frozen fields! Each blade of grass holds a drop of frozen dew, all its own! The sun lights each one and the field glitters! All around the neighborhood, glistening Christmas lights! Yesterday, an ifish member, Teresa, came to fish and to bring something that I bought for one of the kids for Christmas. It was fun! She brought hazelnuts for me and it brought back huge memories! My Grandma in Forest Grove had hazelnuts and each year... well, we dreaded, but we picked up walnuts and hazelnuts. Then, we called them filberts. Funny how many names there are. "Hazelnuts" sounds a bit stuffy to me, now! We'd drag around these huge gunny sacks and fill them and tie them and send them to the dryer. I'll never forget how awful the knees of our pants would be, slogging around in the dirt and walnut hulls. See? I know that term! I know that term because I spent too many years picking up walnuts. It is a horror re-memory that all of us in the family recall. Saturdays on the farm, picking up walnuts. YUCK! But, now? They are memories that are precious to me! If only I could go back and pick up walnuts with my Mom! If only! I miss her this time of year, especially. Even if it's to remember the dreaded walnut season! I carry on the tradition of Christmas because of my Mom, and how much she cared about it! From another dreaded scene, she'd yell up the staircase to lazy kids, trying to sleep in on the weekend. "Christmas is CLEAN!" She'd scream! Ohhhhhhh, to hear her say that again! I'd love it, even though it was awful at the time. We'd rise and have to vacuum and clean and clean and clean! Christmas is clean at our house, too, and my boys dislike it almost as much! I hope they do! I hope they hate it! And I hope they remember it always! I yell to them the same thing, every Christmas season. Christmas is clean at our house, too! I want them to know that awful feeling, because somehow, magically, it remains in my heart as a good thing, rather than the dread I felt at the time. Today, I'll carry on another tradition as I bake our cinnamon swirls and go find some good sausage to go with it. I also must have an electric skillet. Ours broke. So, I'm going to go get one. You have to have one for Christmas in order to scramble a dozen or more eggs. She'd pour them in, and take the spatula and make "egg icebergs" as she'd scrape the bottom of the skillet. Soon, they'd all be icebergs and we'd gobble them down with Voget's sausage and her now famous coffee cake. It's called "Sweet Petals" and I love to make them! I love to make one, I should say. My Mother would make several and send them to friends and relatives. I can't understand how she did it! You have to roll the dough into snakes and then cover each one with nuts and cinnamon. I bet she made a dozen Sweet Petals each year. 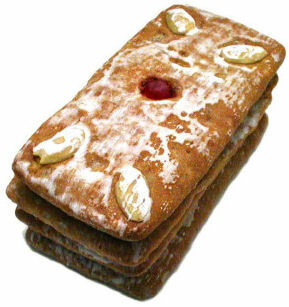 Not to mention lebkuchen ,pfeffernüsse, Vanocka and also the normal fare, fudge, almond roca and peanut brittle! Oh! I'm so so far behind! We were raised calling the Vanocka, "Hoska" bread, but either one, I think it's the same. Pete made me a loaf this year, and I have enjoyed it more than anything! Thank you, Pete! All I've managed this year is the presents and the tree trimmings! Well, my house is all lit up and that's good, but I fail in comparison to the jolly Holiday that my Mother put on! Christmas isn't even clean, in comparison! Help! But, the Holiday spirit is here and alive on the Kilchis River! Merry Christmas to all of you! I hope that your memories of Christmas are alive in your home, this Holiday Season!! And for gosh sakes, I hope your Christmas is clean! There is law and order at Christmas time. Just ask Andrew. He knows! It was 5 in the morning and I was barely awake. The kids stay up late, so I decided to get up early to get things in order. See? The first rule of Christmas at our house, is that we all act as children act on Christmas. That goes without saying. So, at 5:10, as I struggled to get my eyes open, Andrew popped out of his room, took a quick peak around and said "MERRY CHRISTMAS!" "Not yet, Andrew!" (I scowled, and that is against the law!) "I'm not ready!" I quickly turned on all Christmas lights and turned the carols on, softly. Andrew has always been the one to rise before the crack of dawn on Christmas! Always! David sleeps in, takes a ton of time with each present, and doesn't care much, in what order. But, when it was finally time, I went by their bedroom doors as I always do, and said in a deep, husky voice, (just as Santa would!) "Ho, ho ho! Merrily Christmas!" And with that, Andrew's door flung open, and David's.... stayed shut. We finally pried him out of bed. When he saw what Santa brought, he couldn't take his eyes off of them. There, with big shiny bows, lay two guitar cases. Oh, boy! His eyes grew as big as saucers! But-- no! Andrew wouldn't allow it. There is a certain law and order about Christmas, and Andrew was the law enforcement. I grabbed my coffee, and we sat down and watched the boys go through their goods. Razors, and toothpaste and shower gel, oh my! And the traditional life saver books and gold coins and crackers and fake cheese! These are things we have always had in our stockings and they must be oohed and awed over, first. But-- David couldn't take his eyes off the guitars. but-- finally Andrew gave in and led the team to the Guitars. David sat by the fire, after they decided which would get which guitar, and played. He seems to be able to pick up any instrument and just play, like he had studied it in some other lifetime and only had to freshen up a bit. Andrew plays guitar for hours on end. Without a guitar, once, he heard a melody in his head, and somehow constructed a guitar out of old strings and wood, just because he wanted to record the melody in his head. Santa did good! Santa did REALLY good! The ifish classifieds are a really, really cool thing! I got a used phone for David and Santa used the class ads to get guitars for both boys! Thank you, Santa! Well-- back to the law and order of Christmas, there are Sweet petals to eat! And scrambled eggs and sausage! Then, it's off to my sister's house, to see my Dad and family. I can't wait! David is asleep in the living room, with ribbons at his toes, and bows below his nose! He's covered with Christmas paraphernalia! So cute! One Christmas tennis shoe on, to prove it fits, and a guitar by his side. He's happy! Andrew is in recording songs he just wrote, this morning! Soooo frustrating to have server problems! Ifish has been up and down and up and down since we (ha ha) "up"graded last week. We are (believe me!) trouble shooting, but I don't know when it will be resolved. There is only a short period of time in which this happens, and unless our techs are constantly monitoring us, (which is unreasonable to expect) they can't find what is leaving our connections open, so that we get flooded. Then, I just found out that pictures of mine that I upload with a pound sign won't show up. Weird? That may be a clue, as our posts are numbered with the pound sign. Ahhhh... mystery! I just uploaded Stan's column for your reading pleasure. It's a treat, as usual! It's the second part on spinning reels. "Spinning Outfit Is Angling’s Most Versatile Tool" If you haven't read the first part, please go to Stan's archives, and catch up! And, on the 15th, we'll have the last chapter of Francis Caldwell's book! What a great end to the year, 2009 it has been! Stan dropped me a comment about how he hadn't expected to be here on this date, and how many close calls he has had! Wow! I can so relate to that! Thank God I'm here! I've been given a second chance! And third! And fourth! Thank you, Father! I'll never get it totally right, but I'm trying! I mean, look at this! I have outlined the scary month in red, as that was my dissection date. To live through that is unbelievable, really. Most doctors that I meet, if I mention this has happened to me, they say things like, "Nice to see you!" So true! People just don't often live through that! I have Dr. Song to thank for that! But-- that brings up a point. I was supposed to be in for a checkup on that, in November and they haven't called yet. I better put that on my "todo" list. Andrew, too! Bill, Andrew and I sort of live on 6 month leases on life. You go to your appointment, go through the tests, wait for approval, celebrate, and then forget about it all until the next six months! I'm in the waiting/scary/pretest mode and so is Andrew... but we'll see! I think we'll be fine! I'm also a little nervous about the lens in my eye. They are finding that sewn in lenses only last about 10 years before they fall out. My right lens and Andrew's lens fell out just at 10 years! But, my other lens is still in. Will it go? There is a 50 percent chance it will be fine, if resewn. Mine was fine, re sewn. Andrew's was not. :( Oh well. Why even go there? Quit it, Jennie! I see for now. I see for today, and we must all live for this day! Bill will shake his head and say "I don't want to hear anything is broken!" You know, when I complain that the dishwasher isn't functioning, or the freezer is not working. I know how he feels! "I don't want to hear it!" ...and I don't! I so understand! Ifish has been "broken" off and on for a couple weeks, now. We keep having spikes in traffic. Open connections that get flooded and we have no idea where they are coming from, or why it is happening. Our techs are working around the clock to try and catch it in action. It just makes no sense, though! And it happens so quickly that unless someone is watching the server right then, we don't have any way to see what caused it! And, on top of it, our weather station is broken, too! Fun! It's outside and wireless. At least the anemometer isn't broken, but the wind isn't recording. So, after quite a while, talking to tech support, we figured out that the oh... what is the name, the computer part that relays the info to my computer is not working. We ordered a new one, and will be putting that in, today! I hope it is easy to install! Having a weather station is really fun, but it is not without headaches, I'll tell you! When it goes wrong, it goes really wrong! It also dampens the fun of ifish. I keep sitting down to work, and it works fine at first. I get rollin.. I get into the groove, and then it slows to a crawl, totally killing my motivation. Worse than dial up! Argh! Yesterday, Bill, David and I helped Andrew to move to Astoria. I miss him, already and so does Sergeant Pepper. That makes me so sad for his kitty. His Dad won't let him have him, there. After seeing the apartment, I sure don't see why. It's not like it's fancy. I guess rules are rules, but this is Andrew's friend! Oh well. Anyhow, in the chaos of moving, (Isn't moving the worst!?!) I received a phone call that ifish was again, down. Argh! I give up! It's to the point of wanting to say. "Ifish.net? What's that?" LOL Not mine! We will work it out. I know that we will work it out and soon! So, after we moved Andrew, I went to Costco and bam! It hit me! Wah! Why do I keep having to go through this? Shopping down the isles, I kept seeing things Andrew would love to have. Artichoke dip! Oh, Andrew would love that! Oh! Look! A lamb roast! Andrew would love that! It's so fun to have Andrew move back home. There is nothing I like more than to please people with food. I think I get most of my happiness from pleasing people. It's fulfilling to me. It makes me whole! I cook and I love to have people in heaven over it. Anyhow, when Andrew first moved out after high school, I really had a hard time and shopping was the worst. I'd stop in the middle of the isles, and actually cry over a box of cereal he loved. It was so hard! That empty nest feeling! And he keeps doing this to me! He moves out, then moves back, then rinse and repeat! Andrew! QUIT IT! Andrew wrote to me and said, "Mom, I need you to send me pictures of the river and of Sarge, every day. I'm going to miss everything, so much!" We miss you, Roo, just as much as you miss us. Pictures on the way! I still have David at home, though, and until he finds his way, I still have someone extra to cook for. I think Bill is the best, though. I've never heard anyone look at dinner and say, "Jennie, what a beautiful dinner!!" Beautiful dinner? Oh, Bill! Thank you! I need someone like that around me. Someone that says my cooking is beautiful!? And I guess that is also why I do ifish. I like making people happy and people that use ifish are for the most part, appreciative! I do get the occasional bad apple, but most of the people, most of the time, are appreciative for what I have created. But-- when things are broken, and I can't fix it, it is frustrating, indeed. Whether they be ovens, or websites, or refrigerators.. they are all the same! Tools that I use to make thing beautiful are a necessity and they need to work! Otherwise, I cry! So, it's back to the drawing board, back to trying to make ifish the best that it can be. I'm working on it and so are a whole team of good people. We want you to say, "Oh, it's beautiful!" I want you to be able to click, click, click and move around ifish at a speed that makes it fun for you. And for me! And Andrew? I bought the artichoke dip, anyhow! It's beautiful! Please note, also... My Dad appears to be at least for the moment, in need of medical help and assistance, and my family and I are going through a rough period. Please be patient with me, as we try to repair things that are able to be repaired. From family, to internet, to weather station... It's a tough time for us. I am heading to Canby to be with him. One down... Got the weather station fixed! Whee! Just in time for the storms. It's so good to see the Cheese Measles (Ampersat's entry for mag lips) win the poll! I love that style for a mag lip!) Click here to see and while you are at it, pre order for the show! It keeps getting stuck in my craw that I need to do less at the Holidays, instead of more. I don't like being part of the crowd that is so hurried with the hustle and bustle of the Holidays, that it just passes me by. But, how can I do that and enjoy the things I do? I love riots of lights and I mean a bunch! If I don't put them up, who would? And I love presents wrapped carefully and put under the tree! The answer seems to be to do less of that, but I like lots! (And lots!) So, how? How to slow down and still enjoy what I absolutely adore? Somehow I think Christ also adores all the hooplah that we do! The lights! The music! The joy! Would we be more joyful yet, if we weren't so tired all the time? Perhaps, but I can't claim to know the answer. I'm a victim of Christmas! I just adore it! I can't imagine not getting out box after box marked "Christmas before the tree", "Christmas Tree ornaments" and the stacks of cards we receive and also, hand write, every year! These things take time, and we only have so much of that! This morning, I'm rushed, yet again! Trying to make Chicken and dumplings for my Dad, and enough left over for Bill and David to enjoy, tonight. I cooked the broth yesterday, and this morning, before I leave, I have to cook the rest of it, I have to get the Ampersat poll going, get an order in for Kwikfish and Mag Lips, review the mod board, and hit the road, to get to my Dad's house to help him for the day! Pheh! Life is just hurried!